Here is my best attempt to list the top 5 teams in each division in NCS as well as a wild card team(s). Feel free to chime in your thoughts in the comment section below. FIRE AWAY! Your thoughts are encouraged. 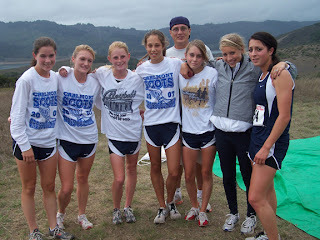 Picture above was taken following the '07 CCS race at the Crystal Springs Course. As covered by the San Mateo Daily Journal and Emanuel Lee. Today we chat with the younger of the Pioneer HS Strum twin brother combo (by a minute), Weston, who just finished 2nd in the Division III race this past Saturday at the Stanford Invitational. Last year, Weston finished in 5th place at the CCS XC meet at Toro Park behind a formidable group that included Nohe Lema (Willow Glen), Mitch Moriarty (Aptos), Peter Birsinger (SI) and Rylan Hunt (Aptos). He also finished in 5th place at the CCS Track and Field 1600m. final with a time of 4:22.49. Pioneer finish 7th as a team last year in XC but they are aiming for a much higher finish this year. With the twins at full strength come November, this will definitely be a team to watch. My twin brother and I have always known we've been kinda fast. Nathan got the 6th grade mile record at our middle school, then in 7th grade, I broke the mile record only to have Nathan beat my time the very next class period. 2) What other sports do you or have you played besides cross country and track and field? I played soccer since I was 5, and quit the beginning of sophomore year to join cross country. 3) If you had to pick between cross country and track and field, what would you say is your favorite sport and why? Track and field, because the pain doesn't last as long and I think I have better middle distance speed. 4) Tell us a little about your brother (Nathan) and how he has helped you become a better runner. We have always competed ever since we were born. We train together during interval training days where we push each other to our limits. He has definitely helped me in middle distance speed workouts, but we don't run together as much as people would think. We hardly run together on long runs. I usually run with my other teammate Michael Zamora or by myself. 5) Where do you think Pioneer stands at the moment in CCS and who are the teams that will be your main competitors to make the state meet? I think Pioneer has a great chance at winning CCS division III. Our main competition is Saint Ignatius, Willow Glen, and Aptos. 6) What are your Track and Field personal records? 1600- 4:17.62 at Arcadia, 800- 1:58.01 at League semifinals, but I haven't ran a competitive 3200 since sophomore year. 7) Favorite run? Favorite workout? Favorite race? Favorite course? Favorite competitor(s)? My favorite run was when my brother and two teammates, Matt Sarge and Michael Zamora, went on a 24 mile run in the hills of quicksilver and mt. uminum and we didn't really know where we were going. It took about 4 hours, but I enjoyed every minute of it. 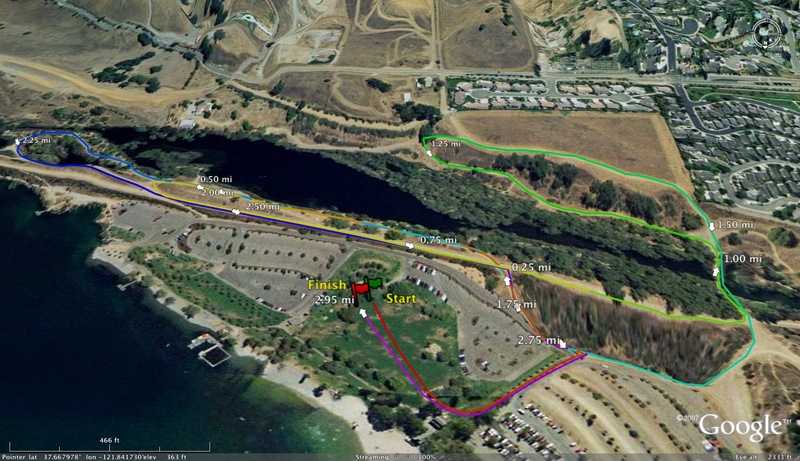 But my favorite run in general is doing the 5 mile loop at quicksilver. My favorite workout is doing a bunch of 200 repeats. It's so fun cause they are over so quick, but doing 10 or 12 of them is still a great middle distance workout. I try staying about the same speed throughout them (800 pace or so) and picking it up on the last few repeats. Favorite track race was definitely Arcadia. This is when I knew for certain that I was a miler. It was so exciting because after 2 laps, I was 2nd to last and I ended up getting 2nd. My favorite cross country race was Earlybird because it was the first time that I have won an invitational. 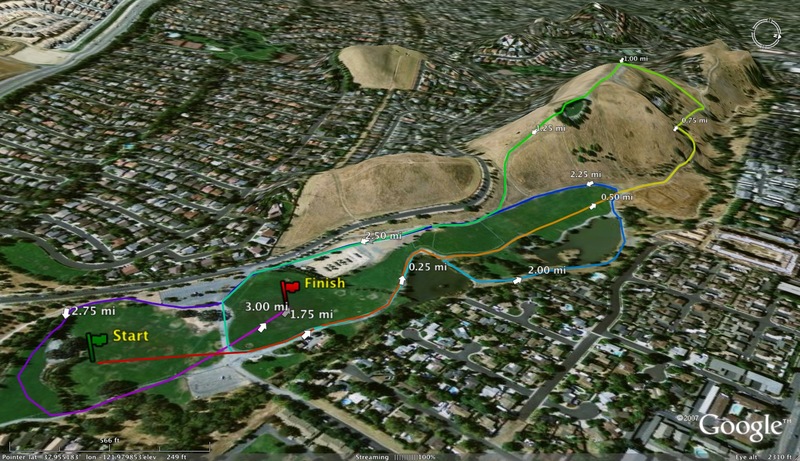 And also, I beat my Toro Park pr by about a minute. This cross country season, my favorite competitor has been Luca Signore. In the Lynbrook meet, we were back and forth the entire race, but he out-kicked me for the win by 4 seconds. Then at Earlybird, he got second and I won by 4 seconds. So we are exactly tied at this point. I also like racing Mitch Moriarty and I feel it is going to be a very close race for the CCS division III title. 8) Tell us a little about your coach and what has he done for you to become a person and runner. My sophomore year, I had the best coach I have ever had and I feel that a lot of my success now can be contributed to him. Darrin Garcia really made me enjoy running and, most of all, competing. He has been my inspiration. But he left after only 1 year at Pioneer. Our coaches now are good, but are not as inspirational as coach Garcia. My favorite quote from him was in a pre-race talk where he told us, "It's gonna hurt, so make it hurt good." 9) Can you tell us a little about your race this past Saturday and how it unfolded? The race at Stanford went well. I was scared because after about 400 meters into the race, I felt extremely sore. I was not expecting to do so good, but I stuck with it. I had no chance at winning my race because Hugh Dowdy took a big lead at about the mile mark and was out of contention from then on. For the rest of the race, it was a battle for 2nd between 4 of us ( Bryan Jordan, Chris Kigar and Mitch Moriarty). We tried reeling in Hugh, but we couldn't gain much ground. It was a back and forth race for 2nd, and I think my middle distance speed kicked in the last 100 meters and I out-kicked them for 2nd. 10) How much will running influence your college decision? I think running will influence my college decision heavily. I really want to run in college, but I want to get recruited instead of just walking on. I also want to be on a good team because I've never been on a team with people way faster than me and I feel that this will help me get faster. 11) What would be your advice to young runners who aspire to do well in the sport of cross country? My advise to young runners is to work hard. Almost no runner can succeed with minimal work put in. My coach said, "running is like putting money in the bank. The harder you work, the more money you put in the bank. And when the race comes, you can only deposit as much as you have put in." Thank you for interviewing me. It is a great honor to be recognized. 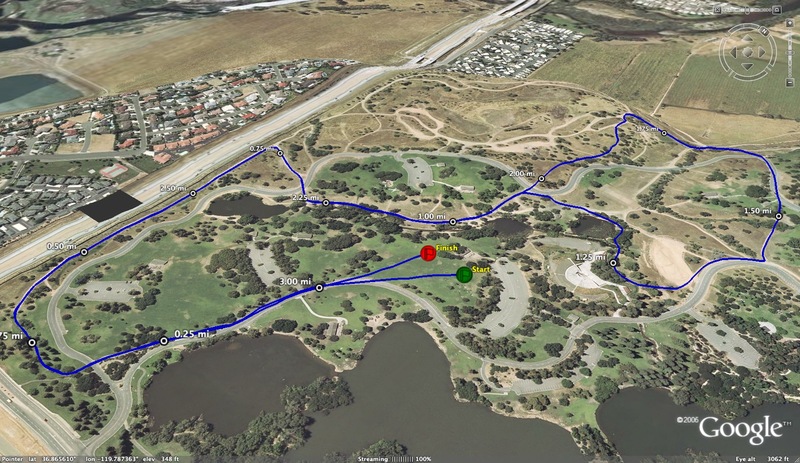 Also, for you fellow stat geeks out there, check out the following course converter that you can use to compare xc courses. Most of the courses listed are CCS based but if you have a course that is frequently used and you have sufficient data for that course, please contact Hank Lawson at hanklaw@ix.netcom.com. He can let you know what he needs to get your course added to the converter. Send me your home town's coverage of your team to albertjcaruana@gmail.com. I will be happy to add those article to the one's above. Missing anybody? Who should be ranked higher? lower? Norcal Rankings as well as the latest NCS rankings will be posted on Wednesday. Feel free to send me your thoughts on either to albertjcaruana@gmail.com. Your help will be appreciated with top 10 lists for teams and individuals (Norcal and/or NCS). First race starts at 9:00am. Should be a great meet with many of the top competitors from Northern California and some of the powerhouse teams from Southern California and other states. Today, we are very lucky to hear from one of the most underrated coaches in the bay area, Sacred Heart Cathedral coach, Andy Chan. He's been very fortunate to coach some outstanding individuals at SHC who qualified for the CA XC state meet including Michelle Gallagher and Shannon Rowbury (more on them below). Michelle's mom, Margaret, is very familiar to the cross country and track and field communities through the terrific pictures she takes during each season. Andy has also coached some outstanding teams at SHC with several state meet qualifiers (Girls '98, '99 and '01 teams/Boys '05 team). You will definitely know when SHC is at a cross country meet as they are usually the loudest and most spirited group at the meet. Andy is also very easy to find with his trademark hat (picture below). 1) When and how did you get your start in running? 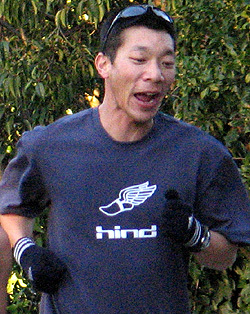 I started running when I joined the track team in eighth grade at Aptos Middle School in San Francisco. The same friend that got me to try track, also encouraged me to join cross country my freshman year at Lowell High School. It wasn’t easy and I wasn’t terrific, but there was something about it that got me hooked. 2) Tell us a little about your experiences in high school and college? Highlights? What is your current running situation and when are you able to train? I ran all four years both cross country and track & field at Lowell High School. I loved being the captain of the team. I think that was the first time in my life that I thrived on being the leader of something. In cross country I got to run at the first two California State Meets (we were the first last place team in California State Meet history). In track & field I had a memorable senior season when four of us ran together for the 4X400, 4X800, and Distance Medley relays. We called ourselves “The Four Horsemen” and brought home a fair number of invitational medals. I did not compete in college. I still like to race. I run for the Pamakid Runners (I’m coach and president of the club). I do most of my running with the SHCP team. Certain times of the year I get in pretty good shape by just trying to keep up with the varsity or by doing what amounts to a fartlek, sprinting from person to person trying to run with as many kids as possible during a single practice. Other times of the year (dual meet track & field season) I do hardly any running other than some 2-3 mile pre-meet shake outs. 3) When did you decide to enter the coaching field? I think I knew as soon as I graduated from high school that I wanted to coach. I remember writing workouts and evaluating the strengths and weaknesses of the Lowell team the summer after I graduated. I went to UCLA and as soon as I arrived there, I asked the coach if he needed a manager. When he said yes, I began my coaching career. I started off by writing down results and passing out uniforms but as the years went on I got to do more and more coaching at UCLA. After I graduated from UCLA, I entered podiatry school. I helped as an assistant coach at Lowell but figured I would be giving up the coaching to be a podiatrist once I finished school. As I neared the end of podiatry residency, I realized that I was just too passionate about coaching to give it up. I decided to get a masters degree in sports management. My mom saw an ad for a head cross country coach at Sacred Heart Cathedral Preparatory so I decided to apply. Twelve years later, SHCP is certainly where I consider home. 4) Who were your mentors as you started out as a young coach? Bob Messina was the women’s UCLA coach when I started. I learned a lot from spending time with him, both training ideas and how to make workouts interesting and fun. In my senior year I got to work with Bob Larsen. I didn’t realize it at the time but I learned a lot from Larsen and he is one of the most knowledgeable coaches in the country. I still look up to my high school coach, Lloyd Wilson, because he got me started in the sport. In fact, Lloyd has been an assistant track & field coach with me at SHCP since I started in 1999. 5) What do you feel are the biggest changes you have made as a coach from when you first started to now? I have a better understanding of what I am trying to accomplish with each workout now. Before it was just hard/easy because that’s “what you did.” Now I pay more attention to the pace people are running and try to make sure we do some training at a variety of paces (e.g. sprints, VO2 max, race pace, lactate threshold, recovery) in a given week. As a result of being older and more experienced, I think I communicate better now with the team, the parents, etc. 6) The best two runners you have coached at SHCP are Michelle Gallagher and Shannon Rowbury. Tell us about each runner, their strengths and some of their successes in hs? Michelle’s strength was her endurance. She liked volume. Before her last track & field State Meet, she had been sick and was just getting better after missing a lot of training. I actually had her do two hard workouts the week before State because she was sharper when she was doing a lot of quality. When she ran her best races it was usually when she had started off conservatively and moved up over the second half of the race. She ran 10:33 at Arcadia, and was 4th in the 3200 at the 2003 State Meet. In both races she ran negative splits and just kept passing people over the last laps. Shannon’s strengths in high school were her speed and race tactics. She had some amazing kicks in high school when she would come from way behind to win a race. She was also very good at following a race plan. We would spend hours going over race tactics for big meets (how fast to go out, what position to be in, when to make a move, etc.) and I guess it paid off. Her major high school wins were 2001 Arcadia 800, 2001 State Meet 800, 2001 Outdoor Nationals 800, and 2002 State Meet 1600. Her high school PR’s really speak to her versatility: 2:08.52 (800), 4:51.0 (1600), 9:38.41 (3000), 17:52 (Woodward Park). 7) Shannon was able to compete in the ‘08 Olympics and ‘09 Track and Field World Championships. You were able to travel to both events. A little about each experience? My wife, Malinda, and I realize that we are in a pretty special situation. I happened to have coached someone who has gone on to run at a high level and we have jobs and the finances that enable us to go watch Shannon compete. Not many people are in this position and this isn’t going to go on forever, so we’ve made the decision to try our best to go cheer for Shannon in person at international championships. The 2008 Olympics is almost a blur in my mind. In May Shannon was chasing the Olympic A standard and in August we were at the Bird’s Nest. There was a moment during the Olympics when I just said to myself, “I can’t believe this is happening.” I don’t think I ever dreamed I would be at the Olympics cheering for someone I know so well. Before Shannon’s race, she jumped up and down three times. Nothing unusual, just part of her routine. I’m sure other athletes did their typical pre-race routines, too. But Shannon’s three jumps just warmed my heart. I’ve seen her jump up and down three times before a race hundreds of times. She’s done it at SI, at Los Gatos, at Crystal Springs. And that night she did it at the Olympics. The 2009 World Championships were better from a track & field perspective. The fans in Berlin were very knowledgeable and I was pretty much in heaven going to the stadium every night for nine nights in a row to watch the best athletes in the world compete. The night of the women’s 1500 final was full of memorable emotions. Shannon was 4th across the finish line and I was happy for her because I felt that she ran a good race and should have no regrets. But then it looked like there would be a DQ and Shannon would get the bronze medal. What an emotional roller coaster the waiting was… Even though I saw her with my own eyes standing on the medal stand receiving a bronze medal at the world championships, it didn’t seem like it was really happening until someone sent me a congratulatory text message. Then I got all emotional. Looking at the pictures now, the smile on my face tells it all – I was so happy and proud of Shannon. To be able to be there and see it in person and give her a hug at dinner later that night was a pretty awesome experience. 8) You also coach adult runners (I believe). What group do you coach? What are the biggest differences between coaching high school students and adults? I have been coaching Thursday night track workouts since 1994. The group has evolved through the years. We call ourselves the K-Stars (K for Kezar Stadium, where the workouts take place). Most of the people who run at these workouts (12-20 people usually come) are members of the Pamakid Runners. The main difference between coaching the adults and the high school team is that I know the high school team’s entire training plan and they are all more or less on the same schedule. So the workouts are quite specific. With the adults, I have a basic track interval workout and just give people guidelines for goal pace. I do coach some adults privately. With them, I give them a training schedule and it’s up to them to get the workouts done. With the team, not only do I write the workouts, I oversee their execution, too. Another difference is that with the high school team, I think it’s my job to help motivate and inspire the athletes. With the adults, I expect them to be self-motivated, so I spend less time on that (although I give the occasional rah-rah speech that they seem to enjoy!). 9) SHC is always a large and spirited team. How do you get so many runners out for you team? What activities do you do to help build team camaraderie? Thank you for noticing our spirit. We pride ourselves on being spirited and I think this year’s cross country team may be one of our all-time best in that department. We really don’t do anything too crazy to get people to come out. We’ve had 47-48 runners the past two years. That’s actually a good number for me. Any more and I feel the experience for the team isn’t as good because they don’t get as much personal attention from me. I strive to make the experience enjoyable so that the kids want to recruit their friends to come out too. I think having a lot of traditions builds team camaraderie because it makes people feel that they are part of something special. We do typical things like team dinners, games at practice, wacky awards, etc. The kids might disagree but having some traditional workouts (even the hard ones) are an important part of our team culture. We also have an annual theme and logo, a senior day, a Sausalito run, and a summer leadership retreat. 10) What are some of the cross country meets your teams have attended in the past few years that have been really positive experiences for your runners? We’ve been to the Three Course Challenge in Seaside, Oregon two times (2004 & 2007). They have three courses there (a hard, a medium, and an easy course). The hard and medium courses include a mud pit the kids have to run through. 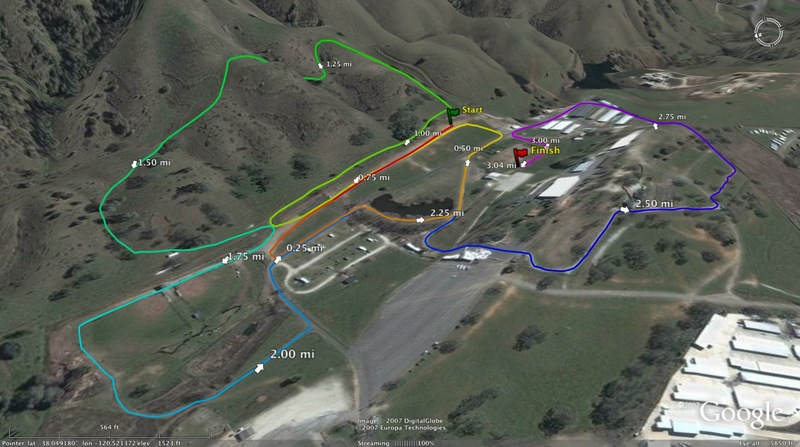 All the races take place on a military base and there are all kinds of challenging terrain that you don’t see elsewhere. “This is real cross country” is a comment I often hear from the kids when we race at this meet. I am always changing up our meet schedule from year to year. 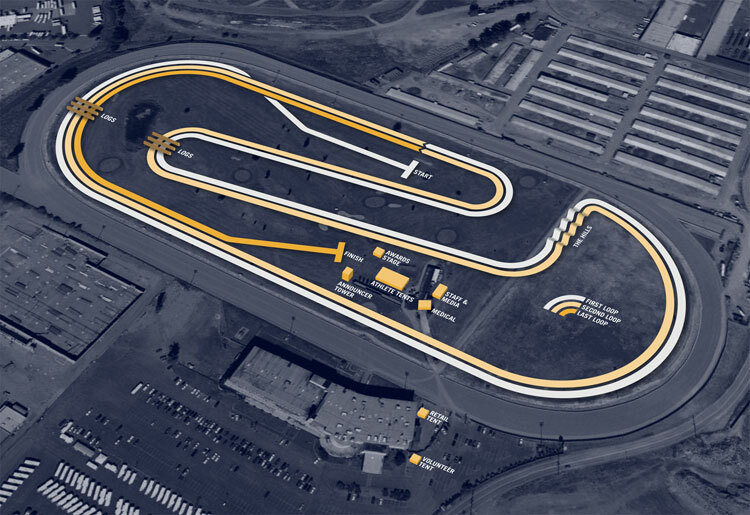 I like to go to different places, race different teams, have a different levels of competition, and also race at some of the same places annually so we can measure improvement. I think this mix of meets makes for a positive experience. 11) What would be your best advice for a young aspiring cross country coach? Be excited and passionate about the sport. Do everything you can to make everyone in the program feel that they are part of something unique and special. When you do that, the kids become very self-motivated. Then the hard work will get done and you can’t help but have success. This sport has been very good to me. I’ve gotten to share my passion for the sport with hundreds of kids. I love how the alumni keep in touch with me and I’m especially proud that many of them have come back to coach at SHCP. Thanks to coaching, I’ve gotten to go to some big meets and experience some fun and memorable times. I even met my wife though running. But there’s no better feeling than being out there at practice doing a hill workout or hard interval and seeing the whole team pushing as hard as they can to get it done. Those moments always excite me and that’s what keeps me coaching. will be posted after the Stanford Invitational this weekend (Teams and Individuals). On the border: Matt Airola(Bret Harte), Josh Mercado(Del Campo). What teams and/or individuals will be making a major statement this Saturday? Who has been flying under the radar? 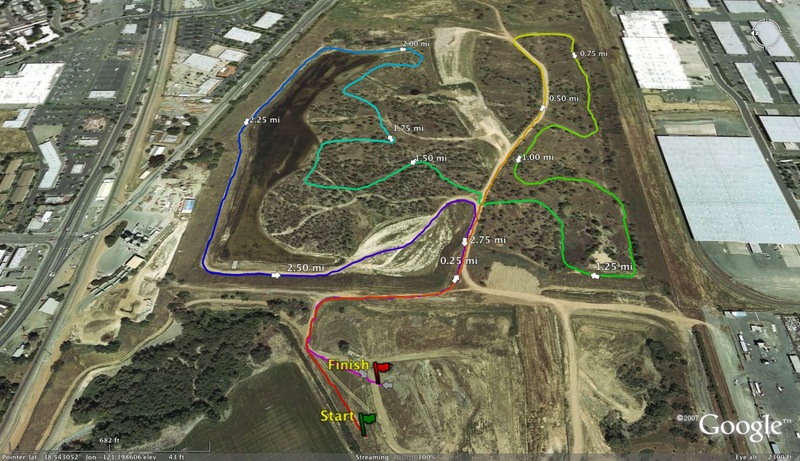 On Saturday, we went down to Irvine, CA to race in the Woodbridge Cross Country Invitational. According to Coach Varvas at Woodbridge HS, this is the largest 1-day xc invite in the nation. We left LL at 7:00am in a 3 car caravan. We took the top 7 boys and girls plus one alternate each. We arrived in Irvine at around 3:00pm and checked into the hotel. At 4:00 we headed over to Woodbridge High School for the race. The girls ran at 7:00pm and the boys ran at 9:00pm. We set up our camp on the lower baseball field. After checking out the course and getting our numbers, we returned to our camp to relax. It was pretty awesome to see the two teams that pulled up next to us while we were gone. One one side of us was Saugus. On the other was Arcadia. Pretty cool stuff. The race itself was insane. The girls ran at dusk at 7:00pm just as the lights were starting to take effect. Most of the girls ran very well. The best thing was to hear how much fun they had in the race. The atmosphere of Woodbridge is totally electric. The girls had huge smiles on their faces after racing. That was really great to see. The boys ran in the Varsity boys "Rated Race" at 9:00pm. This is the 2nd fastest race of the entire day. I must admit that the quality of the field we raced against was as good or maybe even a bit better than we see in the DIII State meet race. Every boy ran amazingly well, even our number 7 that day (Michael Gemar, he is usually number 1, 2 or 3, but he was very sick. He gutted it out). Our number 5 on Saturday was sophomore Ryan Kinney, who stepped up huge when we needed it, despite being knocked over in the middle of the race (he got up and ran afterwards, PRing huge). The boys finished well in the race, and 45th out of around 200 varsity teams on the day (if Gemar isn't sick we would have been around 25th). The rated race and sweepstakes races are crazy. It's like a swarm of bees running together the whole race. Nobody is strung out the whole way! 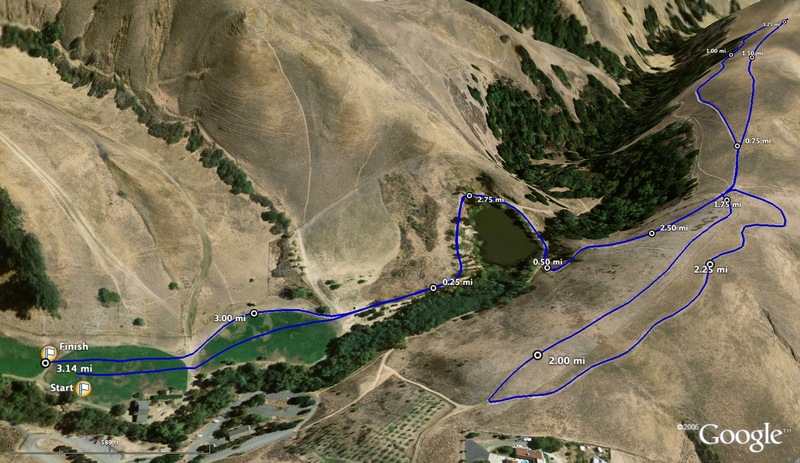 The course is flat as a pancake- it makes Hayward look like Mt. Everest. On Sunday we went to Disneyland during the day before caravanning home at 3:00pm. We arrived back in Walnut Creek at 9:30pm. Whirlwind weekend but well worth it. I believe that we were the only NCS school who went down. I saw Coach Ibarra from North Monterey Country for a second (CCS) and we also lined up next to Del Campo (SJS) on the starting line. Enterprise had a couple runners there as well (Northern Section). I think that is about it as far as NorCal schools go (there could have been a few more but that's all I know of). Over the winter at the NorCal Coaches clinic, one thing that we talked a lot about was competing with the SS teams on the State level. I'm so glad that my guys and girls got a chance to compete against the best of the best down there. All of you coaches who take your teams to a meet down there are to be commended- Mt. Sac, etc. It's just great exposure. I think my team knows now that it not only can compete against the schools in DIII from down South, but we also have a chance to stand alongside them as one of the best teams in the state. What a blast! Thanks to Coach Varvas from Woodbridge High School for hosting a fantastic meet. Good luck to all NorCal teams this year! Please let us know what race your team will be competing in this weekend at Stanford. It looks like the same course as last year. Hopefully the weather will cooperate this year as last year's meet turned into quite the survival fest, especially for the teams competing in the afternoon. 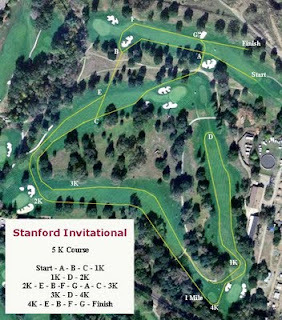 What do you enjoy the most about the Stanford Invitational? 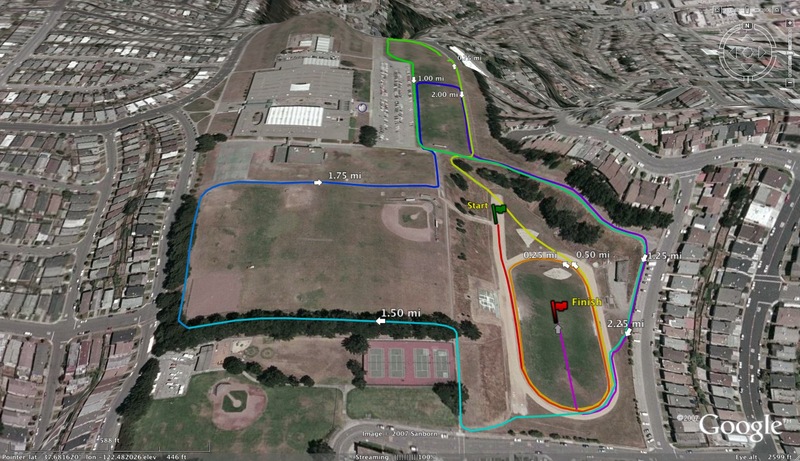 According to Bellarmine coach Patrick McCrystle who measured the courses out with his GPS watch following the meet, the Varsity course came out to 2.8 while the F/S course measured out to 2.07. Results posted at recordtiming.com at the following link. 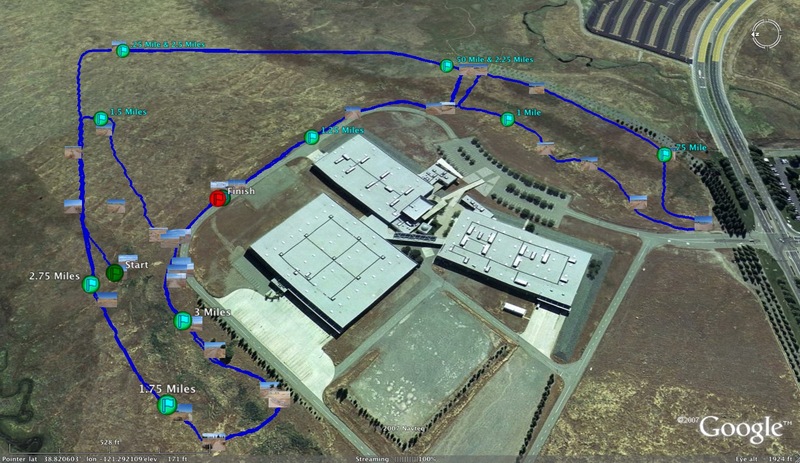 Please note that the pace per mile is based off the old courses (2.93 varsity and 2.13 F/S). Anybody else measure out the course yesterday? Who was most impressive at any of yesterday's meets? Obviously San Ramon Valley made quite a statement yesterday. What other teams? Individuals? Coming up this week, more interviews. Updated NCS rankings. Season SJS rankings will make their debut. Any other suggestions, please feel free to email me. Also, if you would like to contribute to this blog in any way, let me know. Thank you to all the coaches that contributed to the following rankings. Please chime away on teams you feel did not make the list or which teams below should be ranked higher or lower. Comments below will be appreciated. Please identify yourself. Who is missing from the above list? I am not so concerned about placing at this point of the season. Just want to make sure the 10 athletes that belong on each list are there. Just wanted to follow up on the post below. Lauren and her team (Katie O'Neal 31:34.37 10000m. runner and former Stanford All American Adam Tenforde) visited my school today and were very well received by my runners. I think this is an excellent study that will hopefully answer some questions about how we as coaches could prevent our athletes from getting hurt in the future. If you are interested, contact Lauren at the email address below and you can arrange a date and time for them to visit your athletes at your school. The DXA bone density scan is normally $800. Feel free to contact Lauren at the email address or phone number below. Well worth your team's time to take part in this injury study (only 15 minutes to get the ball rolling). Would your cross country team like to participate in a study on injury prevention? Stanford University is conducting research on preventing injury in high school distance runners, and is seeking to visit high schools in Northern California to speak with their teams about getting involved. The study entails an initial 15-minute questionnaire and shorter, follow-up questionnaires to understand the risk factors for injury in this population of runners. Though it is not required, all participants are also invited to receive a free DXA bone density scan and a biomechanical analysis at Stanford. If you would like more information on this study, please contact Lauren Sayres at lcsayres@stanford.edu or (925) 381-7279. You can find the rankings by Coach Small there. Thank you very much for the time and effort he spent in putting those rankings together. NCS rankings will be posted tomorrow with help from several NCS coaches. If you would like to contribute to the NCS rankings, email me at albertjcaruana@gmail.com and tell me who you think are the top 10 teams (boys and girls) and top 10 individuals (boys and girls). Today we catch up with a runner who has made quite a bit of noise on the trails with some spectacular early season times, Petaluma runner, Hugh Dowdy. This past Saturday, Dowdy finished 2nd at the Ed Sias Small School varsity race behind national class runner, Erik Olson of Novato. He's taken over the role of team leader on the Petaluma squad following the graduation of the Lockert brothers (Sterling and Devin). Petaluma has won two team state meet plaques the past two seasons as well as 2 NCS champions in the past 3 years. With Dowdy leading the way this year, they are continuing the winning tradition established by the team in purple. 1) How did you get started in the sport of cross country? To be honest, I started XC as training for the 400 meters; I started my sophomore year, after a year in track as a sprinter. Michael Carroll, now a sprinter for Claremont McKenna College had done just the same, and I looked up to him as a friend and a very strong athlete. 2) Tell us a little about your experience as a freshman on the team. Like I said, I didn't start Cross Country till I was a Sophomore. 3) When do you feel like you made the transition to the runner you are today and began to feel like you belonged with the elite runners in NCS? The transition period for me was somewhere in the summer between my sophomore year and junior year, when I decided I did not want to let go of Sterling, in any run. I tried, sometimes too hard, to stay with him in runs ranging from tempo workouts to easy fun-runs. 4) What changed for you in terms of training that helped you improve as a runner? I don't quite remember any significant change in training during that transition, aside from a sheer increase in mileage, but when I started running with Sterling, intensity rose in my workouts, and emotion played a much bigger role. 5) Did you do anything different this past summer than previous summers with your training? Again, aside from maybe a few more miles a week, summer training pretty well resembled that of last year, but I was a lot more on my own this year. 6) Petaluma had quite a senior group of boys last year. What are some of your highlights with that team? The chemistry last year's team had was probably what is most memorable to me. While we had some flares, and arguments, the team had been growing closer over the past few years. There was the loss of a few key players to graduation, but more or less, it was the same old group, and we kept it pretty fresh. 7) Tell us a little about the transition to this year's team without those runners. Well, the tightness of last year's team had its ups and downs, in that we were so locked in with each others' rhythms and how to run together, but it resulted in a separation of the Varsity team from the JV fellas. I was lucky enough to have a rather smooth transition between the two groups of runners, the leaving Varsity team, and the upcoming guys. Of course I have taken on a role of leadership as the most experienced Varsity runner, but the fire and devotion in the guys has a familiarity to it that also helped. 8) Favorite cross country workout? Favorite run? Favorite course? Favorite invitational? Favorite competitor? My favorite workout would have to be either Mile Tempo Loops or Hill Repeats. As far as races and courses are concerned, I can't say I have a favorite. I think that is one of the drawing points to Cross Country for me, that each race, course, experience is totally different from the next. But to answer instinctively, Woodward is always an interesting experience. 9) What are your track and field personal records? What do you feel is your best race in track? I feel like i have to start off with saying that I feel i did not find myself satisfied with anything I did this last year in track, that it was basically a wash. Having said that, my mile PR is 4:26 (sophomore; after 6 weeks of missed training due to tendinitis of the knee), and I ran 9:40(junior) in the 2-mile. Needless to say, I was disappointed in not breaking my sophomore mile time, and I felt like i left the season with a pretty insubstantial time for the 2-mile, and to be honest, I don't know what I want to focus on this coming year. For now I just have to focus on XC and staying strong and healthy. 10) What has coach Lynch meant to the Petaluma cross country and track and field programs? Coach Lynch has meant everything to this program. Looking back a few years, participation in the sport was at a very low count with only the self motivated and extremely dedicated remaining. With a little luck in the addition of some very naturally gifted runners, and quite a bit of very dedicated research and forming of a training program (and various other aspects of the sport), Jim molded the team into a powerhouse not only in the NCS, but Statewide. And as you know, success fosters interest; resulting in a very populated Petaluma program. 11) What would be your advice for freshmen starting out in the sport of cross country who want to reach a high level in the sport? To keep it simple, my advice would be diligence, and not to become over enthusiastic with training. Over training has been the decline of many a great runner. Personally, i am just excited for my senior year of Cross Country and to see how it unfolds. Freshmen races are posted. More videos will be posted tomorrow thanks to Kevin Liao. Here is my best attempt to rank the top girls' teams in Northern California. It's very difficult to rank teams at this point as you could imagine. Regardless, here they are for your viewing pleasure. Feel free to comment below on teams that you feel should be ranked lower or higher or are not listed at all. The 15th Anniversary Edition North Monterey County Earlybird Cross Country Invitational was truly special. For a meet that started with 3 teams 15 years ago it has turned into quite the kick-off meet in the central coast of California. 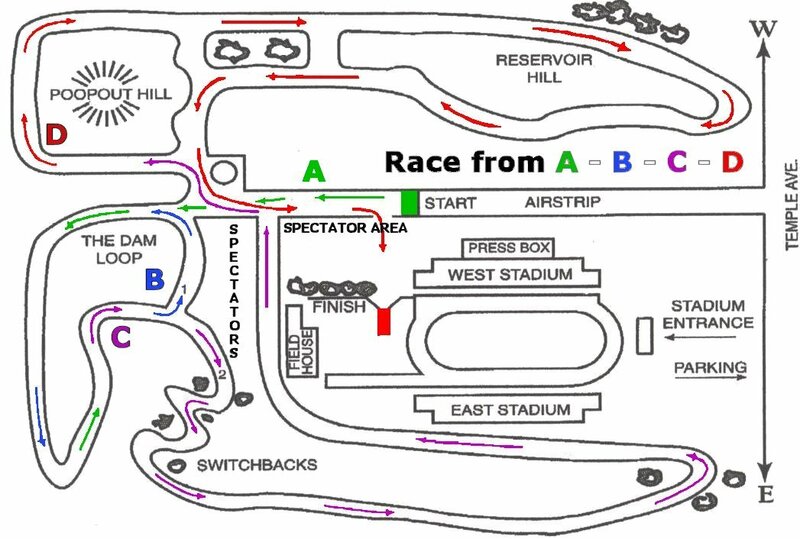 The meet’s main intention each year is to reward the teams that go out there and “beat the bushes” and are able to field full squads in each race. The 2nd goal is to create an atmosphere that runners will never forget and that will hook them into our most wonderful sport. With all the excitement in the air and looking at the results we believe those 2 goals were achieved. A by-product of those 2 goals has been the collection of some very amazing fields in the last 5-6 years, although, these fields seemed hampered by some very hot weather in recent years. The 2009 edition will be remembered as a picture perfect day that made for some high quality marks to go along with our other intended goals! On to the details! Overall, Mountain View High School came, took names, and went home with a truck full of awards! This program has to be considered as the fastest rising elite power in California! Out of a total of 8 races, they took 1st in 3 races, 2nd in 2 races, and 3rd in 1 race!! With that, they took home the plaque for the best overall squad! Las Lomas, Bellarmine (with only boys! ), and St. Ignatius battled for a distant 2nd best. As we look at the meet by genders, the boys stole the show! So, we’ll break tradition and start there! 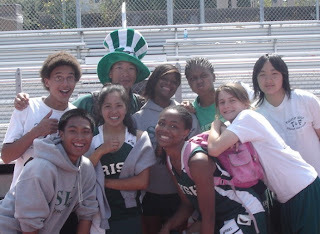 We knew that the 2009 meet was going to be an interesting showcase of some top teams and runners from the CCS, the CS, the NCS, and the NS. Well, today each section had their time in the sun! Once the team times were combined to include all of the races of the day, Bellarmine out of the CCS threw down a shocker! Their scoring 5 ran 15:52, 16:12, 16:24, 16:31, and 16:36! The combined time is 81:35 good for 6th fastest all-time at Toro Park! When those marks are considered it must be remembered that all of the teams ahead of them (Mountain View 80:13-2008, Los Gatos 80:45-2006, Carlmont 80:49-2006, North Monterey County 81:10-2003, and Willow Glen 81:23-2006) ran their times late in the season and most of those teams were running 2-3 minutes slower at the start of their respective year! If Bellarmine can have even a slight progression to sub 80:00 type times, watch out! So much for the coach that said the CCS schools like Bellarmine treat cross country like PE, whatever that means! The Bells are for real in 2009. And, even with that, it should be Mountain View that will ultimately steal the show!! They ran only 2 ticks slower than Bellarmine at 81:37 today without their #1 or their #2/#3 guys! OH MAN!! They ran 15:29, 16:15, 16:20, 16:36, and 16:57! Plug in their #1 guy at low 15’s, and their #2/#3 that ran 15:37 last year and this team is SCARRY good!!! Needless to say, when they line-up their #1 squad and really click, it will be something to watch! Not to be left outdone were the teams that traveled quite a bit to be here. Las Lomas (83:01) from the north and Madera South (84:28) and Clovis West (84:31) from the valley also showed very well! On the individual front Domenique D’Acquisto (11-Enterprise) was coming back from a lacerated kidney during the track season and the way he ran, everyone needs to lacerate their kidney!! 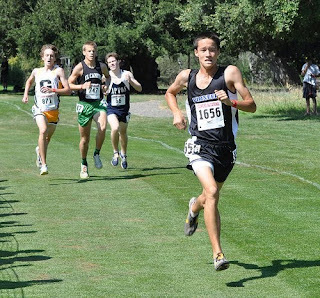 He had won the 9th grade race 2 years ago and was facing last year’s 10th grade race winner Parker Schuh (Mountain View). The two locked horns for the tie-breaker and ran stride for stride through a very controlled 5:19 slight up-hill opening mile. 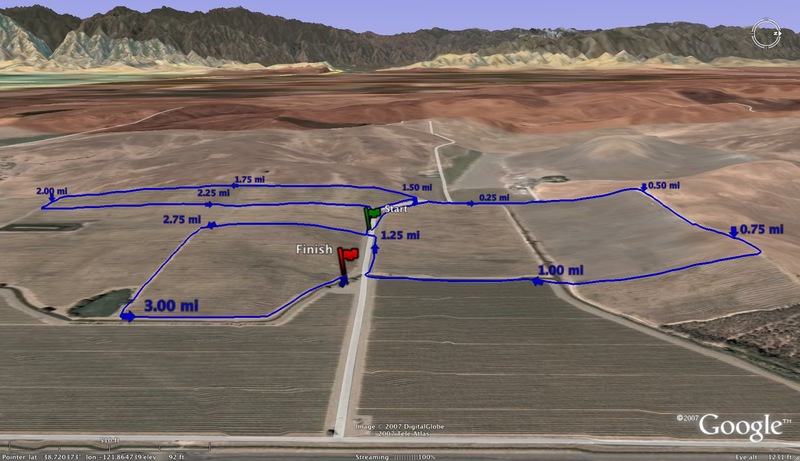 They turned the jets on during the slight downhill and the ensuing steep climb to crest the biggest hills on the course and hit 2 miles at 10:11! That’s a 4:52 mile on the toughest part of the course!!! By then, Domenique had opened a slight lead and extended it with a last mostly flat mile covered in 5:07 to finish at 15:18! The time is good for 3rd best EVER! He only trails course record holder Matthew Petrillo at 15:12 (Los Gatos-2006) and Mohamed Abdalla at 15:13 (Willow Glen-2007)!! To give you an idea, he is now faster than the likes of Diego Estrada (Alisal 15:20), Jeremy Mineau (Menlo Atherton 15:21), Dylan Fitzpatrick (15:22 Carmel), Alex Dunn (15:24 SLV), Ben Morales (15:24 San Benito), and Tyre Johnson (15:27). Parker Schuh hung on tough and ran 15:29! Ironically, his time now has him tied for 12th best ever at the park with his very own current teammate Garrett Rowe, and remember, the 3rd head of the monster, Ian Myjer, ran 15:37 here last year! How is that for a 1-2-3 team punch? The 15:29 is better than the likes of Ben Sitler (15:31 St. Francis) and Nathan Huerta (15:34 North Monterey County) that were some of the state’s best in their time! The seniors didn’t want the juniors to steal the whole show and had a great day also. Apologies to Westom Strum (Pioneer) that was left accidentally left out of the meet preview and made us look very bad running 15:33!!!! His time moves him to #14 all-time between Ben and Nathan! Breakout CCS runner Luca Signore (Lynbrook) also wanted to make the list and did so at 15:37, good for #20 all-time! Not bad!! Four guys in the top 25 all-time and two teams in the top 10 all-time in early September! WOW!!! We should also mention that Michael McCabe (10-Willow Glen) got his 2nd Earlybird win in 16:09 to top all the youngsters! With the ladies we had Aptos throw down some very good early season marks without their top runner! Running 19:41, 20:02, 20:04, 20:12, and 20:42 for a combined time of 100:41! The CCS DIII power will now set their eyes on the state!! Watch out! Throw in their #1 girl into the mix and another state title may be within striking distance!! Mountain View girls wanted to join their boys in the party and showed well at 19:14, 19:45, 20:43, 20:44, and 20:59 for a 101:25! CCS schools ruled the day here as Gilroy (103:20), St. Ignatius (103:39), and Los Gatos (104:09) rounded out the top 5! On the individual front it was the story of multi-sport star Rachel Hinds (11-St. Ignatius) going for her 3rd Earlybird win in a row and getting it in 18:46! We hope she returns next year to try to accomplish the almost impossible, 4 Earlybird wins! The valley was represented well in the senior race with Alisha Brown (Madera South) and Carina Mendoza (Madera) once teammates and now rivals running 19:09 and 19:13. Allison Sturges (10-Mountain View) got a 2nd Earlybird win in her race at 19:14! And finally, a couple of nice surprises came from Morgan Lira in 19:24 (10-Valley Christian) and from Nadine Huerta 19:30 (12-North Monterey County) from the host school. We hope you enjoyed the meet and continue to make Earlybird your kick-off tradition each season! Have an amazing 2009 season!!! If you have links to newspaper articles that covered the Ed Sias Invitational or the Earlybird Invitational, forward them to me at albertjcaruana@gmail.com. Newspaper links for coverage of the Ed Sias as well as the Earlybird Invitational will be added tomorrow. Girls' Norcal Rankings will posted as well. Look also for Josh Small's girls' CCS rankings. For those of you that attended either of the meets mentioned above, who was the most impressive runner? team? Most improved? 1) If you are a coach and have a team website, please add www.crosscountryexpress.com as one of your links. 2) If you are a coach, please let your fellow coaches in your league know about this blog. 3) Please email the local newspaper that covers your team to albertjcaruana@gmail.com. 4) Please continue to send me your suggestions for athlete and coach interviews. 5) If you have any great pictures that you would like to send for Photo of the week, email them to the address above. 6) Any other suggestions on what you would like to see on this blog, please use the comment section below. Thank you in advance for your help. Most teams are now in full racing mode and many of you are attending your first invitational today. Best of luck to all. AL BERRIN’S TIDBITS – LESSONS LEARNED OVER 35 YEARS OF COACHING, DOING THINGS THE HARD WAY, MAKING MISTAKES, AND OCCASIONALLY GETTING THINGS RIGHT. Athletes and coaches all want success to happen today. It is important to take the long term view for your athletes and realize that if you can keep them healthy and running, their success will be greater in the long run than if you push the envelope and have your athletes missing large chunks of training time because of injury. If you bring athletes along slowly, your 24 minute starting freshman should improve close to 20 minutes by the end of the freshman cross country season. If that same freshman makes it to their senior year, they probably will improve to 16:30 because they have trained consistently and increased their volume and intensity appropriately without too many injury breaks in training. If you have 10 guys running 16:30 as seniors with a bunch of juniors between 17 minutes and 17:30, Sophomores in the 18:30’s, you will be successful at all levels and will avoid the prospect of feast and famine years. It’s true, you will have years when everything comes together, you have a group of superior athletes, willing to make the necessary sacrifices and all of the stars line up properly. But, patience and consistency insure you will be competitive, even in those years when the talent pool seems to be thin, you have to chase those athletes hiding in the bushes because they don’t want to work that hard and the stars are misaligned. In conjunction with our athletes, we try to set goals (both realistic and ones they might need to reach for) for each season. We set weekly mileage goals and work out both “realistic” and “reach” goals for each athlete. We set these goals based on last year’s mile times (for cross country). 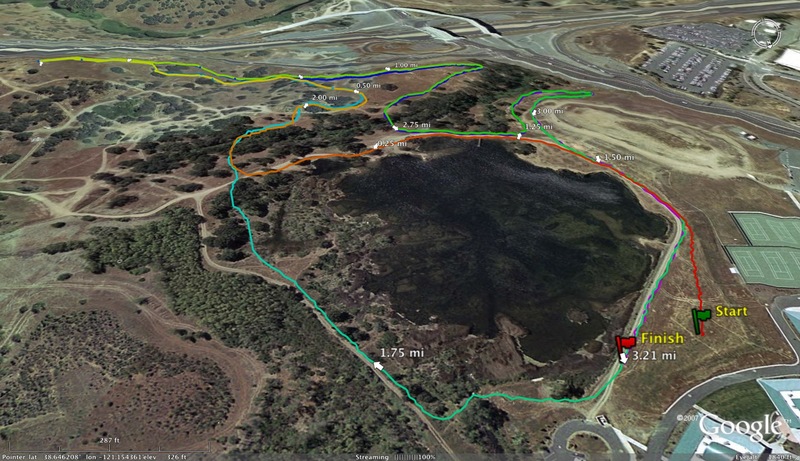 We project track mile times based on our athletes best time on Crystal Springs Cross country course and set paces for track based on possible mile goals. We use various charts (Irv Ray’s charts, Jack Daniels charts and Gerry Purdy’s charts) to help pinpoint goals and paces. This allows us to set paces for each athlete which are appropriate for that athlete and will not have those running paces be too intense for their current abilities. It also allows us to work with goal pace workouts and date pace workouts. Goal paces are the paces you hope they will be running by the end of the season. Date paces are paces which are appropriate based on the athlete’s current fitness level and conditioning. You might want the athlete to be running 4:20 by the end of the season, but currently they are able to run 4:35 in February. You can plan workouts that take into account both date and goal paces. Our cross country teams average about 70 athletes and I have 65 distance runners during track. Each athlete has their own goals and their own paces. We group athletes with similar goals for tempo, VO2max and anaerobic workouts and make sure they are adhering to the paces which are appropriate for their developmental level. Transitions increase the chance of injury. When people first heard about Arthur Lydiard’s program of Base, Hills, and Speed, they assumed during the base period, you do nothing but mileage, then change to hills during the hill phase. 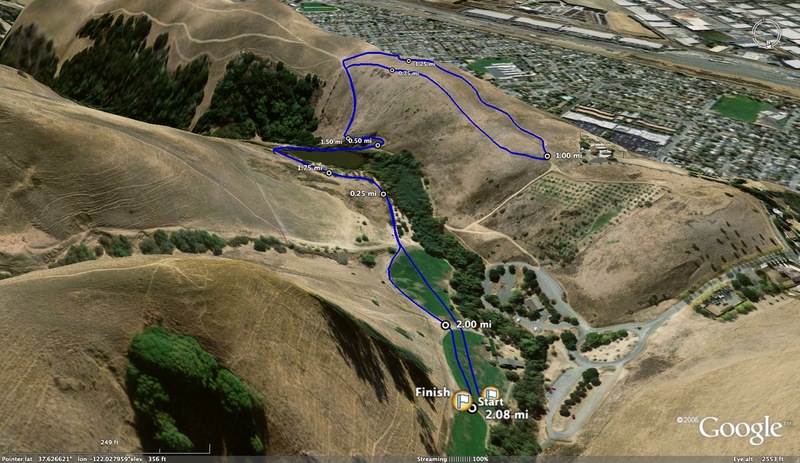 People who tried the program would get through the base period and get hurt when they jumped into the hill phase. I try to get rid of as many transitions as possible. We try and get the kids to train over every possible surface and terrain right from the first week of practice. We get them to wear every shoe they will be in during the year including spikes, during some part of workouts in the course of a week. There will be more discussion of “every pace” in tidbit #6. The biggest mistake most coaches make when they are trying to peak their athletes is in changing the percentages of different kinds of training they do. The traditional method of peaking athletes is to increase the intensity as you get closer to the goal race and also cut the volume. This can increase the percentage of intensity to volume. Most coaches instinctively plan their seasons and each week with a variety of paces and intensities but don’t actually attach percentages to these different paces and intensities. When planning each week, I break down different kinds of training into percentages. If you do try and peak your athletes, keep these percentages in line with your weekly miles, so the ratio of weekly miles to intensity does not increase. If you change the percentages, your athlete’s chance of injury increases. I have gone to countless clinics in the last 15 years. One of the questions I always ask is how the speakers “peak” their athletes. After they explain their system, I ask them what percentage of all their seasons has been successful at peaking athletes at the right time. With additional questioning, most admit peaking is a little bit elusive. It is always one of the first and most popular questions at most clinics because most coaches are looking for ways to improve their current peaking technique. Most coaches are pretty good throughout the season at getting their athletes to the part of the season where we want to peak them. It occurred to me at some point that if I simply followed the KISS principle (Keep it simple stupid) and continue doing the same program throughout the season, the kids might continue having success and improvement when they race. We do cut the volume a little, but we continue doing the same thing that made us successful in the first place. Many coaches beat a dying horse. If they are doing a VO2max workout, they feel they need to make sure the athlete spends a large portion of the workout “feeling” VO2max. I believe you can “touch” a training zone more lightly and still accomplish the aim of the workout. Lyle Knudson, physiologist and author, in discussing some workouts he saw Kenyans running stated that in the course of a 10 mile run, they might spend a mile (1 tenth of the workout) running at their goal pace. If it works for them, it might also work for our athletes. I prefer to try and hit as many “training zones” as possible within a specific workout. I might start a workout having athletes run their first 2 intervals at 80% of their VO2 max, The third one might be at 83%, then 2 at 85%, 1 at 88% and 1 at 10K pace (92%). I covered 5-6 “training zones” in this workout, including touching the upper levels that were my goal for this workout. Because we are hitting the faster paces late in the workout, we actually are probably slopping into some anaerobic zones and also doing some lactate buffering. I had them in the training zone I wanted when they are tired. My feeling is that excessive intensity enhances the chance of injury. If I can lower the odds of injury which will interrupt training, by lowering the intensity, my athletes will thrive because they are more consistent in their training. My feeling is that any injury is a stumbling block to maximum improvement. Injuries can occur not only because of intensity of training, they also can occur because of excessive volume. If your athlete has been running 20 miles a week, and suddenly jump to 60 miles a week, their chance of injury increases exponentially. We look at our athlete’s volume, based on a 50 week a year program (Irv Ray). If your athlete says they are running 30 miles a week, they are probably telling you their highest mileage week, or what they did during the entire season. Look at their mileage based on a full year (50 weeks). An athlete who ran really well last year might have covered 500 miles in the course of the 12 week cross country season. That’s 41 miles a week. They decided not to run track and didn’t do much during the season (didn’t play lacrosse, go out for baseball or play soccer on a club team). After your meeting in June, they got gung ho again and ran 500 miles during the summer. Which group should you place them in mileage wise? From September to September, they ran a total of 1000 miles. Divide that by 50 weeks and they actually averaged 20 miles a week for the entire year. If you put them in a group averaging 40-50 miles a week, you might be enhancing their chance of missing training time because of overuse injuries. They might be ready for 35-40 miles a week, but you need to watch them very closely to make sure the miles a week they are doing is appropriate for their level of fitness. The same thing is true for athletes who did other sports in the spring. Our natural progression for athletes who do both track and cross country is to try to increase weekly miles about 10 miles a week per year. Some athletes might even be able to handle a little more than that, but that is a safe margin of increase. Athletes, who do another sport in the spring, are a little more difficult to assess. There are benefits to an athlete doing other sports in the spring (its killing me to even say this), but when they re-enter the running world, the coach needs to be very careful when they assign a weekly mileage goal to that athlete. Possibly assign a number of miles for the spring season based on how much running they actually do in the sport. For instance, you might assign more miles to an athlete playing lacrosse than you do to an athlete playing baseball. But the important thing is to get some yardstick based on how many miles they ran during the entire previous year when you are assigning weekly miles for the season. Memory is a tricky devil. Many times we remember what we want to remember and forget what we want to forget (except for Peter Brewer who remembers everything ever done). Those people who have run a marathon realize how faulty memory can be. When you finish, the first words that usually escape your lips are “I will never do that again”. Yet there you are, eight months later, standing on the line with 26 miles stretching before you. If you don’t write down what you wanted to do, what you actually did, and how your athletes reacted to a workout, you will forget when it comes time to assess how successful that workout and the entire season went. You will forget important things that would really help you make changes, so your program will be more successful in the future. At the end of every season, I try and do an evaluation of what we did right and what needs to be improved. Both are important. Nobody gets every season perfect and so change is inevitable. Without something in black and white, our memories might forget an important detail that could dramatically change the results of a coming season. I’m sure there are hundreds of other potential tidbits out there just waiting to be discovered. Tidbits on warm ups and cool downs, The emotional and psychological end of training is a vast wasteland of tidbits. As coaches, we are always “borrowing” things that we think will enhance and improve our programs. Hopefully, someone can use some of these tidbits to avoid some mistakes, keep from doing everything the hard way, and actually get more things right, more often.